These brief pieces form a meditation on our threshold for violences, great and small. They probe the ironic relationship between our vulnerability to violence and our will to live, and the extent to which we hold ourselves accountable when violence happens in our midst. Someone who identifies as darksoulofdeath2 has a post on Yahoo! Answers asking what a fan belt is. The post has elicited responses ranging from mirth to indignation, as well as a couple of patient attempts to engage with the query seriously. Darksoulofdeath2 has offended some, not because everyone is expected to know what a fan belt is but because the question, instead of being posed under Yahoo! Autos, appears on the site’s Martial Arts page. “You mean like in a car? You’ve got to be kidding me. I’ve seen some questions posted in the incorrect section by accident, but damn!” says Bujinkan Ninja. Another response begins teasingly but goes on to offer a concrete description: “It’s a Black Belt . . . that is attached to pulleys (one of which has a fan blade mounted to it that’s attached on the water pump) that as the belt spins it will turn the fan’s pulley blowing air onto the vehicles radiator” [sic]. But I may be the one person to whom a fan belt question on a martial arts page makes sense. A fan belt is a Black Belt. . . . Spend a little time browsing on the website of Black Belt Magazine and your hazy sense of the philosophy behind traditional East Asian martial arts is confirmed: it’s about discipline, courage, and humility. Far from representing a Darwinian survival contest, the traditional martial arts emphasize rectitude and chivalry. They teach us about duty, loyalty, sacrifice. And the sifu who models these virtues for us, who teaches by example, is in the Chinese tradition seen as a father. Black Belt, fan belt, father. This is where they converge, in a memory. I learned that such power is indifferent to its reach. And I learned how variably we humans respond when we find ourselves in the grip of its tyranny. I’m not among the knowledgeable when it comes to cars (or martial arts). But I’ve never had to ask what a fan belt is, what it does, or what it is capable of. When I first heard the term—at fourteen, from my father—I learned of its dark power. I learned that such power is indifferent to its reach. And I learned how variably we humans respond when we find ourselves in the grip of its tyranny. It must have been a Saturday in 1978, shortly after we acquired our secondhand, dark blue Toyota Corolla, because only my father had to head out to work that day. It was a winter’s day by Karachi standards, which is to say that the sun warmed the morning up into the fifties. We were still huddled under our thick cotton blankets when Abbu’s shapely hand waved goodbye and he headed downstairs. We heard the metal gates of our house clank open, the car door slam shut, the engine start, purr, and stop. Funny sound, not really a purr at all—more like a strangled sort of gruffness. Restart, same unfriendly sound, and stop. The car door opens again, and then there’s a long silence. Panic in our hearts now. Abbu is a heart patient whose parents died young; his own death has always seemed possible to us. Besides, he is prone to fainting—a phenomenon I now know in myself and my son as a vasovagal tendency, often triggered by the sight of blood but mostly inexplicable. My two siblings and I toss off our blankets and run out to the balcony, our mother behind us. There’s Abbu standing at the hood of the Toyota that never made it out of the gates. It’s still parked in the small space between the concrete stairway and the metal gates that remain open in anticipation of its exit. Abbu’s head is bent over the open hood of the engine. We’re relieved, then curious. We run down the concrete stairs, still in our pajamas. Abbu doesn’t respond. His gentle brown hands continue to fumble around in the engine. When he finally looks up, we see the mix of pain and revulsion on his face. Then our eyes fall on the amorphous black and white fluff in his hands—black and white with red streaks. The kittens are in pieces. Seeking shelter in the car engine, oblivious of the danger in their place of refuge. We scream and fly back up the stairs and into our blankets. We have quite forgotten about Abbu’s vasovagal vulnerability, what the sight of blood can do to him. Or maybe we know that self-indulgence is not an option for him in this moment. That he wouldn’t abandon the scene if he could. Maybe we expect him—trust him—to stay put and deal with the bloody aftermath. To do his duty chivalrously, sparing us. To be the sifu who models discipline, courage, and sacrifice. Whatever the case, we leave Abbu standing there, alone by the open gates, holding the kitten bits in his shapely hands. She’s a three-pound, fifteen-ounce baby, born too soon. Born October 30, 1966, before she’s ready for the world or the world is ready for her. First in our family to be born in the Western hemisphere. The doctors at London’s Hammersmith Hospital send her mother home without her. “This baby’s only chance is the incubator,” they say. What a hopeful word, incubator. Where good things, bright things, happy things hatch. The promise of feathered dreams taking flight. So the baby first sees the world through a sheet of glass. Reaches out her dark brown hands, this way, that way, there’s cold, hard glass. Glass between her and the warmth of human flesh, between her and the pulse of another heart. Because human contact could kill her, don’t you know? Glass that makes gawkers of the family. They look from a distance but must not touch. For a month she lies in an incubator in a room in a hospital—box within box within box. The survivor grows up in Karachi, a dark, brilliant child who never smiles in photographs. She’s a toddler who eats fistfuls of dirt, a tween who throws things at her younger brother, a teenager who fights with her parents and believes she is a bad influence on her little sister; who spends weekends brooding in her room, the door shut and nobody knocking. She cries as she watches Chariots of Fire, its Olympic runners who reach the finish line against all odds. She becomes the first girl in the family to win a scholarship to a college in America. In eighteen years her family has grown cold, hard, and aloof. They look from a distance but do not touch. Three months before it’s time to leave for Smith College in Massachusetts, the survivor gets up on a chair in the bedroom of her Karachi home. She ties one end of her long cotton dupatta to the ceiling fan, the other around her neck, and kicks the chair from under her. One hot and sticky day in Pakistan’s coastal city of Karachi, the girls of the Cambridge section at St. Joseph’s are filing back into their classrooms after recess. Exhausted from the Herculean endeavor to push through the mob of girls outside Abdullah’s or Mrs. Velo’s snack bars clamoring for chili chips, ice cream soda, or milk toffees, we collapse on the wooden benches of our eighth-grade classroom, envying those whose seats are directly beneath the ceiling fans. Our forty-odd pairs of hands reach for water bottles even if the water in them is already tepid. The air circulated by the ceiling fans is much too warm, but in time it will work its magic: our uniforms will unglue from our backs, the semicircle of sweat beneath our short sleeves will fade, and the rivers edging our temples and hairlines will begin to evaporate. It’s time for Senior Miss Fikree’s geography class. Through the haze of humidity and the pungent odor emanating from the semicircled sleeves—an odor whipped around the room by the ceiling fans—we will our minds to grasp how high- and low-pressure systems develop in the atmosphere. Doesn’t the little bird know that some risks are not worth taking, some curiosities and yearnings best buried within us? Suddenly a sparrow swoops in through the open door, sending the girls aflutter. What on earth is the little bird doing here, among us? How disruptive, how foolish! Was it tempted indoors by the relative cool of our high colonial ceilings or overpowered by a freak, exploratory impulse? Doesn’t it know that some risks are not worth taking, some curiosities and yearnings best buried within us? Within seconds the sparrow has realized its mistake. But unable to see its way out despite multiple possibilities of escape, it becomes a winged frenzy. It darts from one end of the classroom to the other in blinding flashes, to the gasps of the girls, who duck their heads, cover their ears, shut their eyes. Nobody wants to witness this degree of desperation. We all know it doesn’t have to be this way. But none of us knows what to do about it, not even Miss Fikree, and in any case, it all happens so fast. 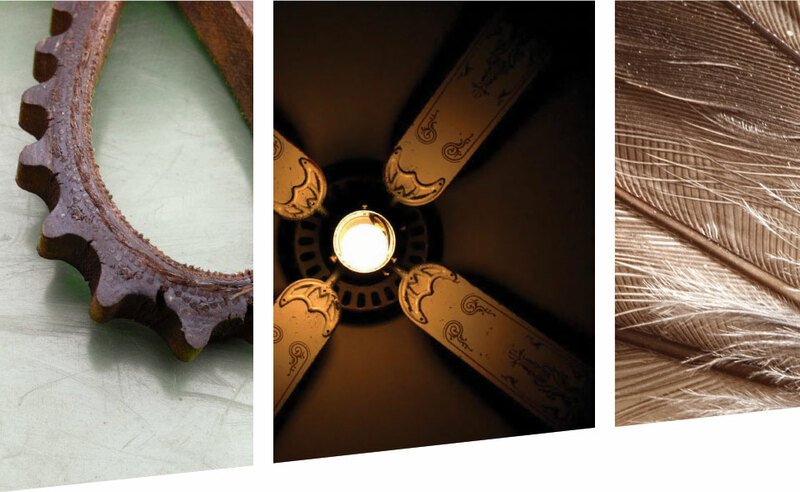 Next thing we know the intruding bird—so small, so afraid, so out of place—has fluttered straight into a ceiling fan and sliced itself between the blades that continue in their own circular frenzy. Down comes the sparrow, a bloodied pulp on the classroom floor. It lies as still now as it had pulsated with frantic life a moment before. An ounce of flesh and feathers at our feet. I wonder now why we hadn’t all jumped to switch the fans off the moment the sparrow flew in among us. We might have saved its life. Could our own physical comfort have made us indifferent to the threat it faced? Perhaps the spectacle of the bird’s vulnerability simply paralyzed us. Or did the danger fail to register because we failed to imagine it? I think about the sparrow’s flight and fall, its impetuous, audacious venture into our world. I wonder if it had a moment’s regret. Decades later, I can hear the desperate flapping of its tiny wings. But I have no memory of its cry. A scholar of race, gender, and war in multiethnic American literature, Samina Najmi discovered the rewards of more personal kinds of writing in 2011. 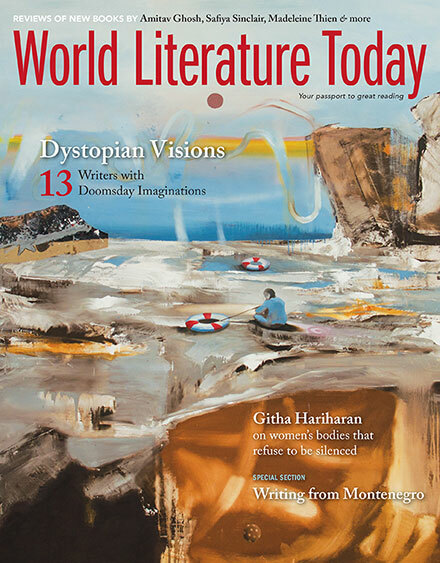 Her essay “Abdul” won Map Literary’s 2012 nonfiction prize. 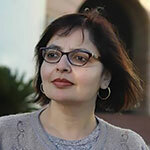 Samina grew up in Karachi and London and now calls California’s San Joaquin Valley home.